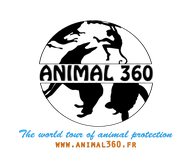 The animal protection and the environment protection are linked: therefor, we decided to offset the animal 360's carbon footprint . Why? We are aware that our travel, involving the use of means of transport (plane, bus, train, car...), has negative effects on the environment because it emits carbon dioxide into the atmosphere. In this way, to offset our carbon footprint seems obvious for our project, which defends animal conditions : the environmental protection is very interrelated! How? By planting some trees! To calculate our carbon footprint, we use a calculator from the goodplanet fondation: for all our trips, we know how many tons of carbon are rejected, and for each ton of carbon, 4 to 5 trees need to be planted. We also decided to offset our carbon footprint with Reforest'Action, a french company with which we can finance the planting of trees in Haiti, Indonesia, Senegal.